Hello, hello! Happy Monday to you! I hope you’re checking in today after a fun weekend! I haven’t had the chance to type up our weekend recap yet which will be coming your way shortly, but in the meantime I figured I could share a peek into last week’s weeknight meals with you guys. This post is the third one in my monthly weeknight meals series and includes a mix of slow cooker, vegetarian and Paleo recipes. I was clearly excited to continue using two of my favorite cookbooks, so you’ll notice a few recipes I made this week came from them as well! I made sure to include any notes about my alterations to the recipes below and photographed the meals as we were about to eat them so you can see what they look like in the moment without any fancy schmancy food styling. And now here’s a peek into what dinner looked like in our house last week! This recipe was the first one I tried from The Whole30 Slow Cooker Cookbook and we made it again last week which should tell you something about how much we loved it! If there’s one thing I love more than a tasty slow cooker recipe, it’s a slow cooker recipe that doesn’t require any chopping! (Hence why we make our fav cheesy crock pot chicken corn chili on repeat!) 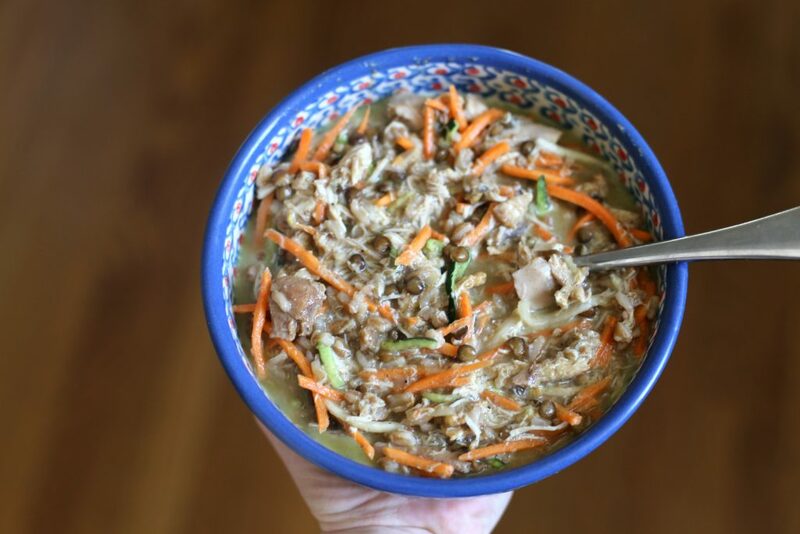 These Indian Chicken Noodle Bowls could not have been any easier to make and we just threw the chicken thighs into the slow cooker with spices and broth and then added coconut milk and spiralized veggies noodles (zucchini + shredded carrots) in at the end. 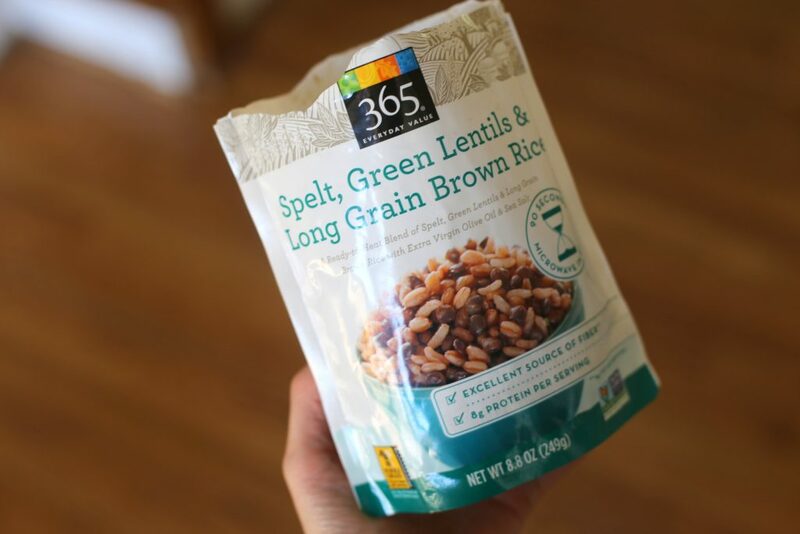 I knew from the last time I made this recipe that it wouldn’t be overly filling the way the recipe was written, so I before serving the noodle bowls, I stirred in some spelt, green lentils and brown rice from a ready-to-heat pouch I bought from Whole Foods. This meal was a simple one thanks to an easy marinade! The only change I made to the marinade was to swap maple syrup for the honey since I knew we’d be giving tiny tastes of the steak to Ryder and honey is a no-go for babies under one year old. 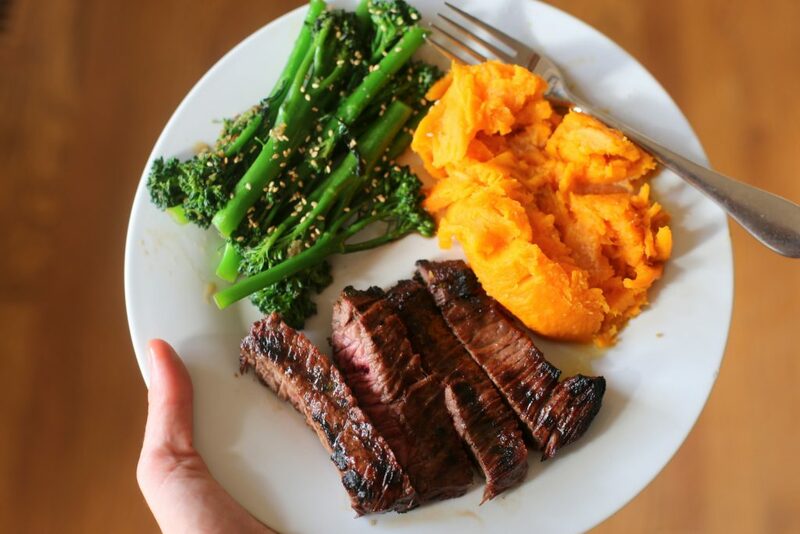 While Ryan grilled the skirt steak outside, I prepped the sides which included my all-time favorite broccolini (a must-try especially if you love ginger sesame flavor) and sweet potatoes. It was a delicious dinner that made me feel all the more excited to begin grilling out with more frequency this spring! 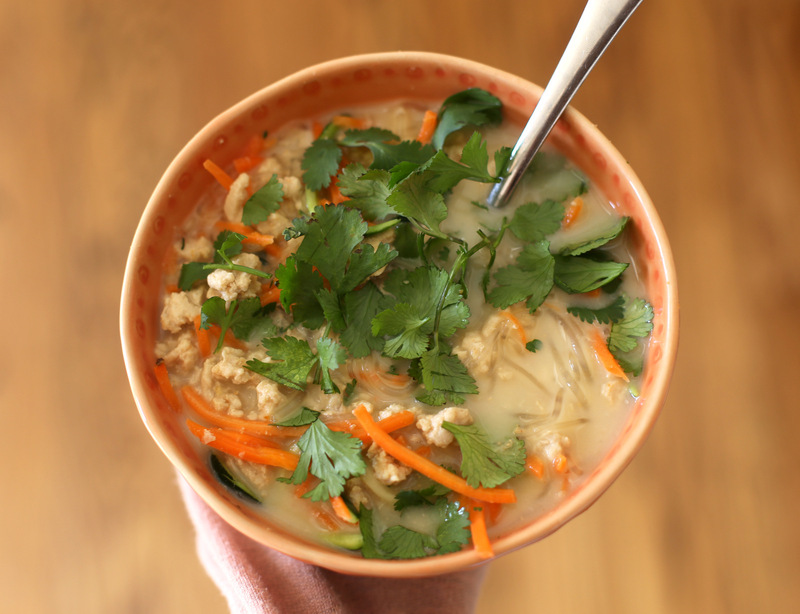 This recipe was another winner from The Whole30 Slow Cooker Cookbook! I followed the Instant Pot directions rather than the slow cooker directions in the cookbook and we had a healthy and flavorful dinner on the table in less than 30 minutes. I made a few changes to the original recipe — I added a whole diced onion, some red curry paste, zucchini and kelp noodles — and, to be completely honest, I think my additions really helped the dish taste a little more exciting than it would’ve on its own, as it’s a pretty simple recipe. I must also add that while this recipe was quite nutritious and veggie-packed, I found myself feeling hungry again and reaching for a snack not too long after dinner, despite the fact that I used full-fat coconut milk in the recipe which I thought would give it a little more staying power. Next time I’ll be making a side of brown rice to stir into this one to make it a little more satiating. 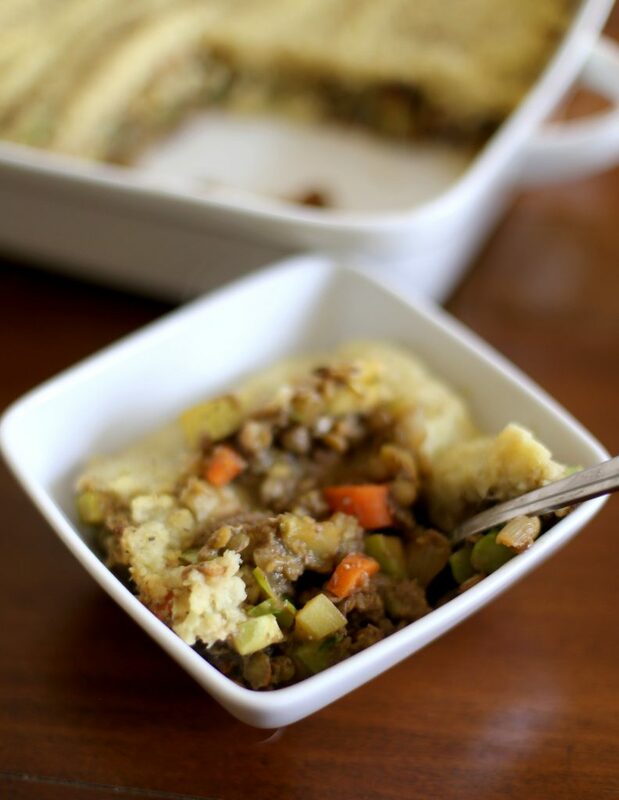 The lentil veggie filling in this shepherd’s pie from the How Not to Die Cookbook was ON FIRE. It was so, so good and I couldn’t get over just how much I loved the gravy that held everything together. The recipe is vegetarian and the gravy is made with a combination of mushrooms, nutritional yeast, miso paste, thyme, umami sauce (I subbed coconut aminos) and pepper and it blew me away. The only thing I would change about this recipe is to use real mashed potatoes on top instead of the cauliflower mash the recipe called for to give it more of a comfort-food flare. The recipe was one of the more labor-intensive weeknight meals I’ve made in a while but well worth it! It’s also one that could very easily be prepped ahead of time which is my plan for the future! I call this an “I don’t want to think about making dinner kind of dinner,” meaning it’s the kind of dinner I can make on autopilot! 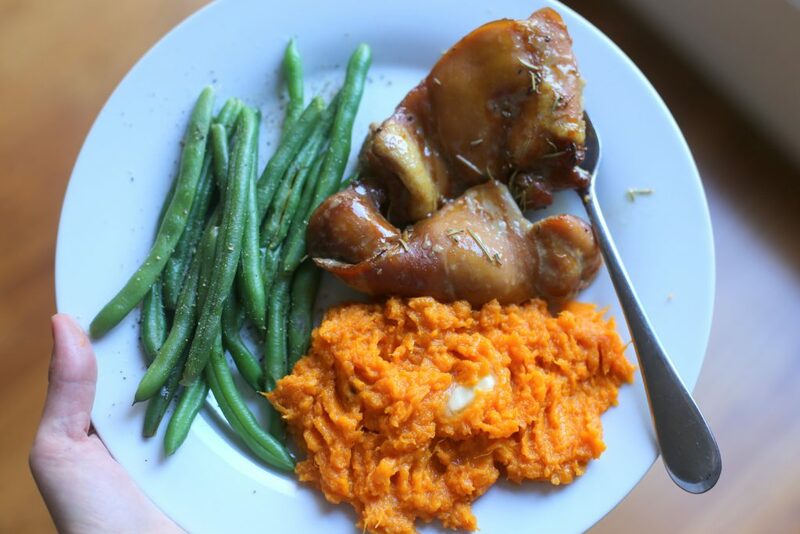 I marinated a couple of pounds of chicken thighs in my favorite Paleo chicken thigh marinade and served them up with mashed sweet potatoes and green beans. Earlier in the week, I made a big batch of roasted sweet potatoes to have on hand for lunches, so the mashed sweet potatoes came together in a flash since the only thing I had to do was mash them up and add some butter and salt. We’ve been eating a lot of green beans around here as well because they’re one of the only cooked vegetables Chase loves (he oddly prefers raw vegetables over cooked veggies BIG time) which I find oddly amusing since they were my favorite vegetable as a kid. 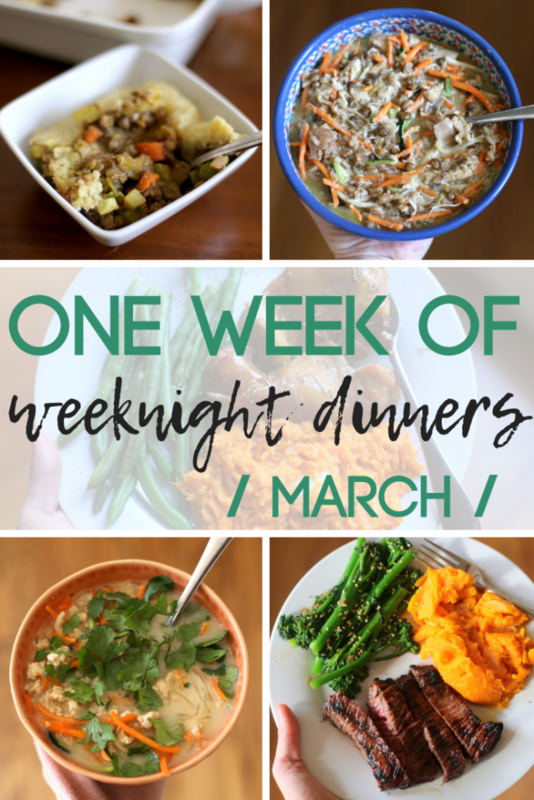 What is one easy weeknight meal you made last week that was a slam dunk in your house? Love this! I’m also super interested to see what Chase’s dinner looks like when you do these as well. I’ve been trying to hard with the “love,like,learning” and also the deconstructed method for my son, but it seems like he has only gotten worse! Luckily his younger brother is so far not nearly as picky and eats mostly everything (except veggies) that we out on his plate! But I would still love to see what Chase’s meal looks like! I’m always trying to do new things!! That noodle bowl and shepherds pie are calling to me! All the recipes look delicious. I also love seeing what you you serve for sides to get inspiration. Here’s a recipe for Slow Cooker Moroccan Chickpea and Turkey Stew from Skinnytaste that we made and loved! sounds fantastic!! i love gina’s recipes! thanks for sharing! We have doing several sous vide meals a week – we buy several chicken breasts, pound them out and mariante them and freeze them until we’re ready to use them, then sous vide them when we’re ready, add a green veggie + a potato or sweet potato and we’re good to go! All of the meals look great, especially the Lentil Shephard’s Pie! I’ve been meaning to make this but haven’t gotten around to it yet, but it definitely looks incredible! I swear you can never go wrong with a Pinch of Yum recipe! !